Does your dog have ITCHY SKIN? HOT SPOTS? SMELL YEASTY? How about CHRONIC EAR INFECTIONS or ITCHY EARS? We can help!!! Fur-Ever Loved Pet Salon is pleased to introduce the Epi-Pet product line. 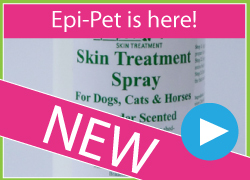 Epi-Pet is an innovative and affordable skin care product line, for more permanent control of pet odor, scratching and skin irritation.